The Blue Peter mural of the show’s presenters and pets, designed and painted in 2005 by a 10-year-old viewer of the TV programme, is to be saved and restored as part of the redevelopment of Television Centre. 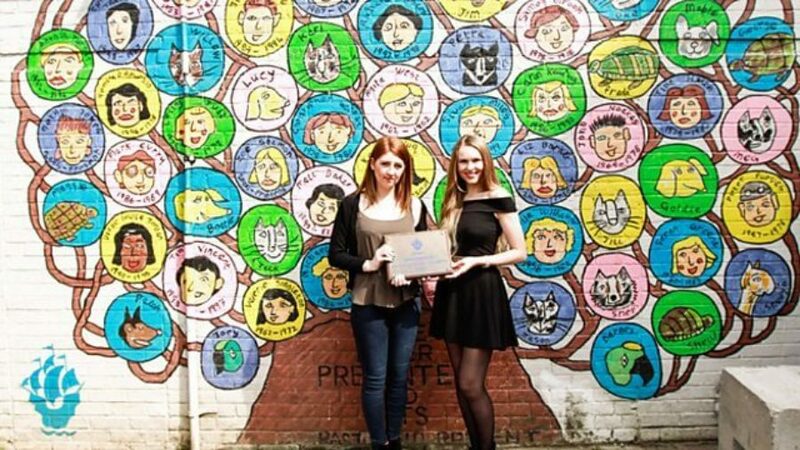 In April 2015, ten years after she painted the mural, Emma Bayes, who won the competition to design the mural for the Blue Peter garden wall, was presented with the original mounted plaque by former presenter of the beloved children’s show Zoe Salmon. More than 18,000 children entered the competition to paint the mural 'Blue Peter Past and Present', which depicts 31 presenters and 22 of the programme’s famous pets. They include the original presenters from 1958, Christopher Trace and Leila Williams, later presenters such as Valerie Singleton, John Noakes, Matt Baker and Zoe Salmon, and the Blue Peter dogs Petra and Shep. Inspired by her early artistic success, Emma, of Margaretting, Essex studies fine art and art history at Plymouth University. She said: "I'm really pleased that the mural is being saved, having expected it to have been forgotten. “I think it’s important to inspire young people and encourage them to get involved with art and it's lovely to know that after all these years something that I am proud of is still going to be visible to the public and remind people of the history of Blue Peter." Zoe Salmon, who was a presenter on the show from 2004 to 2008, said: “I have many fond memories of my four years on Blue Peter. It holds a very special place in the hearts of all of us who worked on the programme and preserving this mural for future generations is fantastic." The original Blue Peter garden will form part of the opening up of the site to the public as it merges with Hammersmith Park and its location will be marked with a plaque, creating a lasting legacy to the world’s longest-running children's TV show. When Blue Peter moved to the BBC’s new centre at MediaCityUK in Salford in September 2011, the sunken garden, its ornamental fishpond and bronze statue of Petra – the show’s first pet – were also relocated and is also now accessible to members of the public to enjoy when visiting Salford.